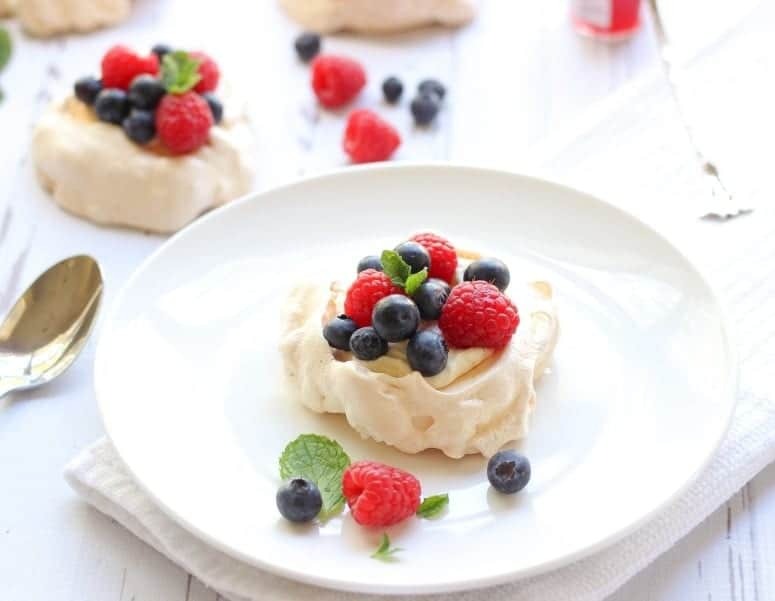 Crispy and sweet meringue and soft Mascarpone filling are combined in this sophisticated yet easy mini pavlovas dessert that will surprise and delight your guests. 4rth of July is right around the corner. Have you planned out your menu yet? :) Well, regardless of whether you celebrate it or not, there’s always the right time for some good yummy dessert. Isn’t it? The first time I made meringues was like 3 or 4 years ago. They were a good treat, but very basic. It was my first time attempt after all. This time, however, I went a little further and took a basic meringue recipe up a notch. Remember my Instagram pic from a month ago? That’s where I got an inspiration for my patriotic mini pavlovas. No matter if it’s hot or cold outside, I’m always up for a cup of hot tea and some good reads. Btw, don’t you think those meringues on the cover look mouthwatering?) Can’t wait to make them. These mini pavlovas are a bomb. As soon as you take a bite, you’re hooked. Do not open the oven until the end of the baking time. These little cuties exceeded all my expectations. They were delicate, crispy and light. It’s a definitely melt in your mouth delight. Preheat the oven to 250 F and line a baking sheet with a parchment paper. Put the egg whites and a cream of tartar into the bowl and beat on a medium speed until the mixture forms soft peaks. Increase the speed to high and start adding sugar, 1 tablespoon at a time. Add vanilla extract and beat until stiff and glossy peaks form. Take a rubber spatula, gently fold in cornstarch. Spoon 8 mounds on a prepared baking sheet and using a back of the spoon create a slight dip in the centre of each meringue. Bake 1 hour. Turn off the oven and let the meringues dry completely in the oven for about 45 minutes. in a large mixing bowl, combine heavy whipping cream and mascarpone cream and beat until stiff peaks form. 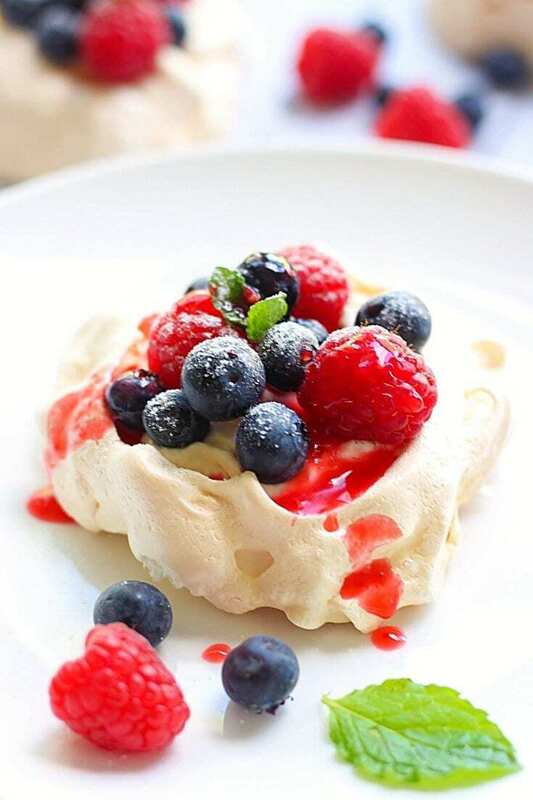 Spread about a tablespoon of cream into each meringue, garnish with berries and dust with confectioners sugar. The recipe modified from Better Homes and Gardens magazine (May 2016). These look so delicious! And adorable! !